There’s a bunch of new details and trailers for the upcoming addition to the Japanese fighter series, The King Of Fighters XIV. In these trailers below, we see more detail on the “Art of Fighting” team including Ryo Sakazaki, Robert Garcia, and Yuri Sakazaki along with the “Fatal Fury” team: Terry Bogard, Andy Bogard, and Joe Higashi. Both teams are specially trained in a certain art but all have their own unique style of going about them. 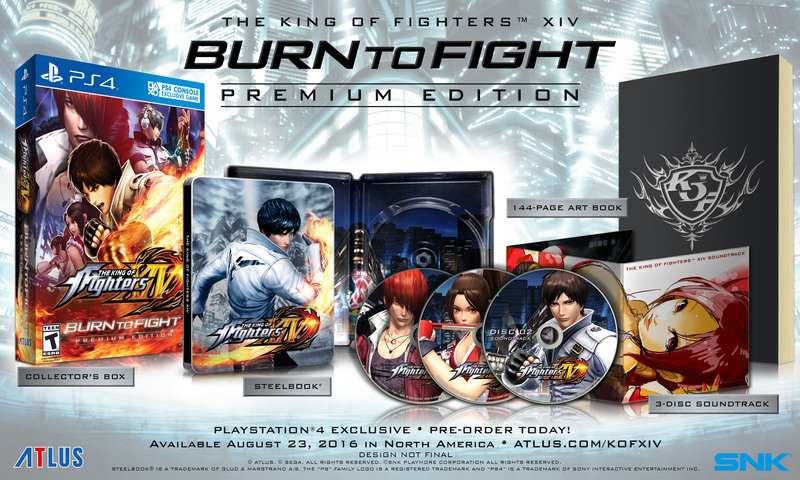 It doesn’t stop there, Atlus has also announced that a “Burn to Fight” Premium Edition for The King Of Fighters XIV will be released in North America and it will include a steelbook (Kyo Kusanagi on the front), a 144-page art book, 3-disc soundtrack with 60+ songs in a Mai Shiranui illustrated case, and a collector’s box for $79.99 / CA $99.99. The Classic Kyo costume will also be available for download the first week of launch while anyone who’s pre-ordered the game will get a special steelbook case. The King of Fighters XIV is due out for PlayStation 4 in North America on August 23, 2016, in Japan on August 25, and in Europe on August 26.